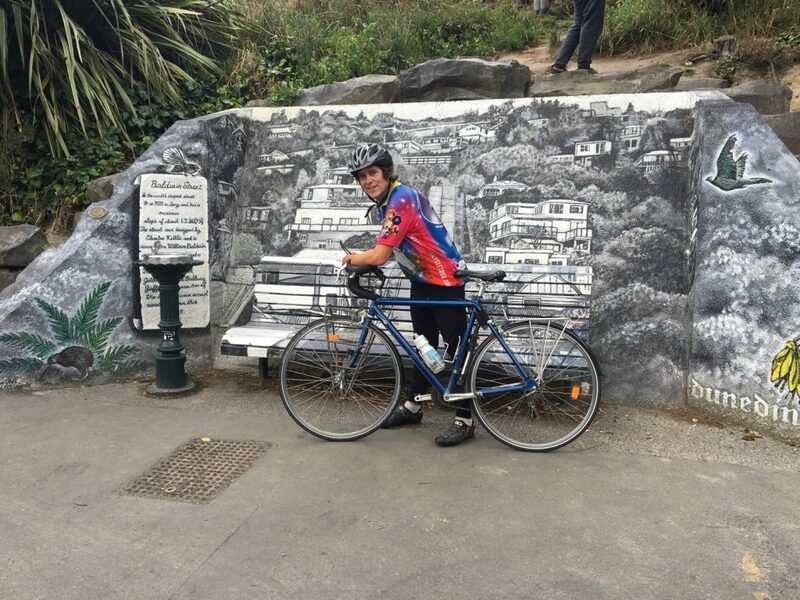 I forgot to mention in my last post that the ride into Dunedin put me over 1000 miles for New Zealand! And what a ride it has been… some of the most difficult roads, but the friendly people and beautiful vistas have made it worthwhile. After an exhausting ride to Dunedin. 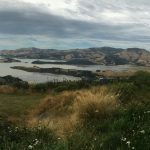 The next day after arriving in Dunedin was Monday (2/6). Back in the USA, however, it was still Sunday–Super Bowl Sunday. My hosts located a pub in town that was showing the Super Bowl, and we went to watch it. There were just a few people there–all college students and a few Americans. I was disappointed that all of the commercials were for ESPN, instead of the usual ads. Some of the New Zealanders complained too, understanding clearly the most entertaining aspect of this venue. And just one more thing… am I the only person who realizes that the Falcons lost simply because they shifted to a “prevent defense” with too much time left on the clock? That it wasn’t really a great comeback by Brady? 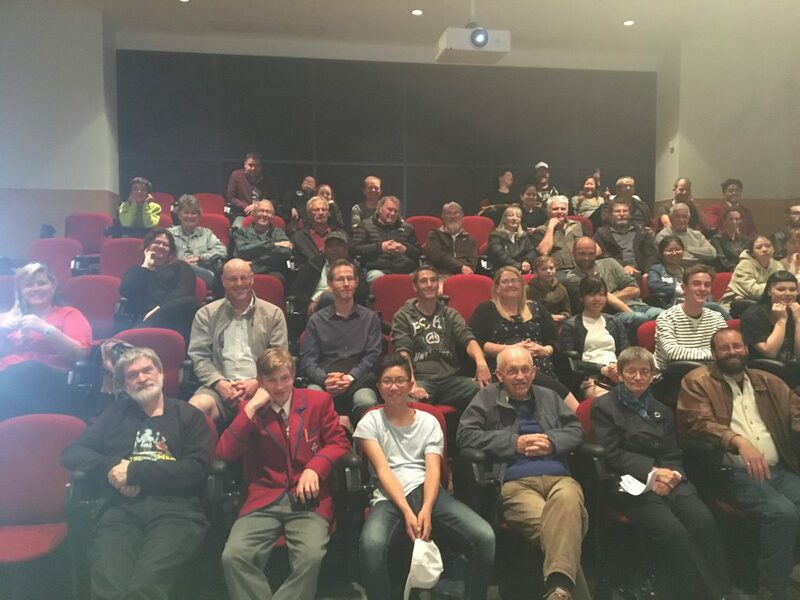 The next day, I made three appearances to promote JWST: Kavanagh College (a k-12 private Catholic school), the Otego University Physics Department, and the Dunedin Astronomical Society (at the local museum). I ended up getting a TON of press from this, especially from the visit to Kavanagh College. A newspaper reporter and photographer came by and talked to me for a while, and took some pictures. 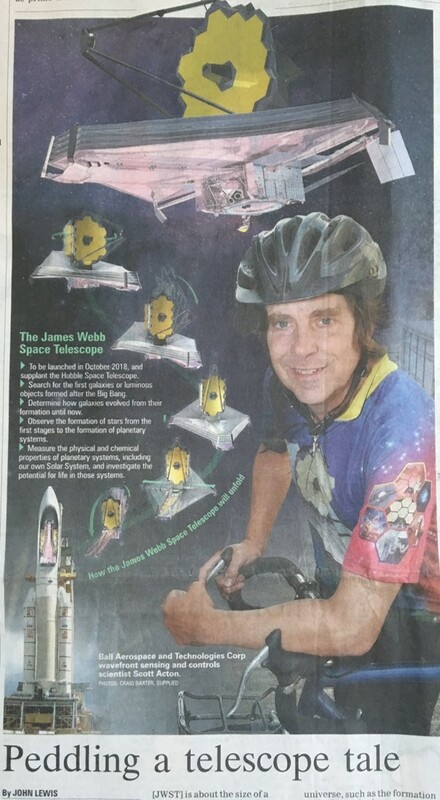 An article was printed the next day, featuring the graphic I showed at the top of this post. Cool! The only problem is that, with all the time I spent talking to the paper, getting my picture taken, and a teacher giving a lengthy lecture to the students about their expected behavior during an upcoming field trip, there wasn’t any time left for me to actually talk to the students. Seriously! I had 60 seconds and was able to answer some questions. Some of the students were able to come to the public talk at the local museum at least. Before the talk at the Museum. The fellow in the red in the front is a student at Kavanagh College. His name is Anton. Anton is one of the most impressive kids of his age that I have encountered on this journey. I expect great things to come out of Anton. Here are several links to articles, etc. that came about because of my trip to NZ. I seriously did not expect all of this attention! It feels nice to have someone take notice. 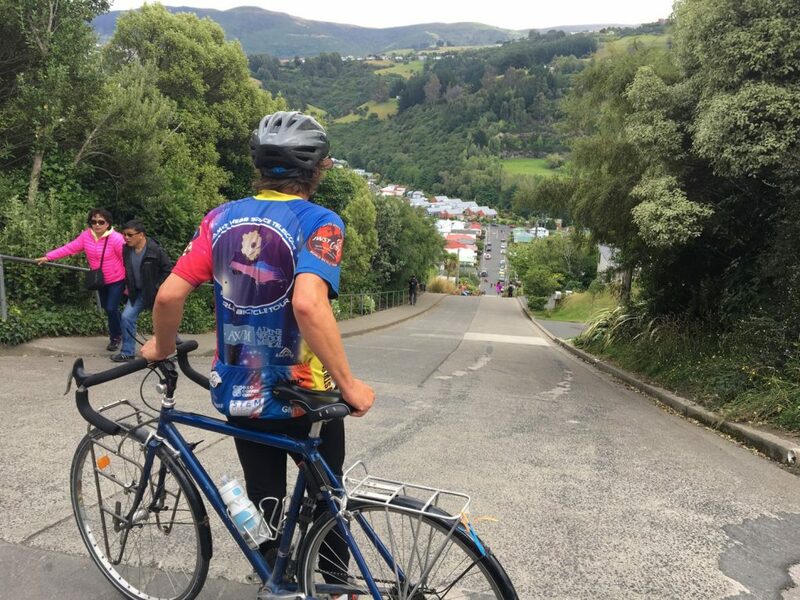 The following day, I stayed in Dunedin so I could cycle up Baldwin Street, supposedly the steepest residential street in the world. I could believe it. The street is paved with concrete rather than asphalt. Otherwise, on a really hot day, the street would all run down to the bottom. That’s how steep it is. Now, I need to be completely honest. 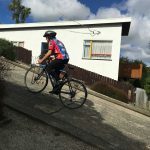 There is a **really** steep section at the very top that I did not ride. I was afraid that my bike would fall over and I would roll down the hill. But, I did the other part 3 times, so I could get the pictures that I wanted. I’ve already posted the picture of me cranking up the hill on the 3rd attempt. But here are a couple of other pictures from the very top of the hill, and one taken from the bottom. At the top of Baldwin Street is a mural of Baldwin Street. And there are chickens at the top of that. 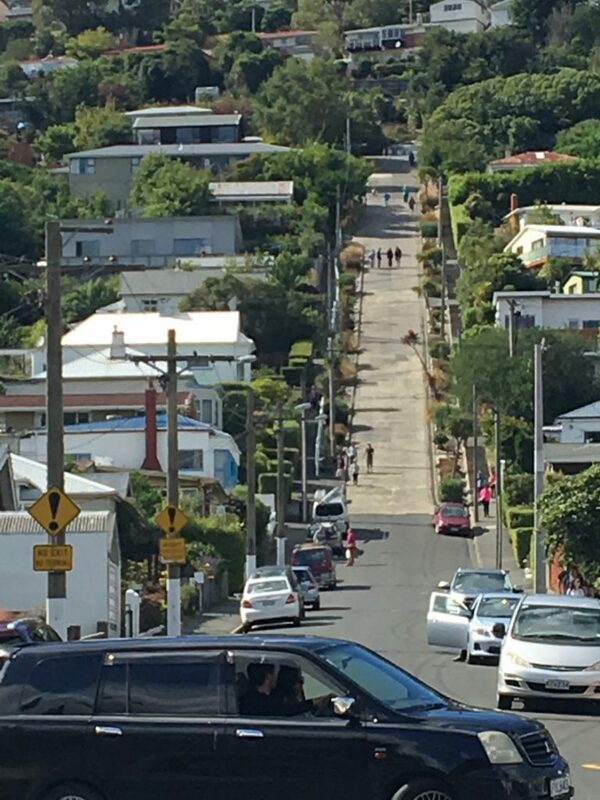 Baldwin Street as seen from North Street. 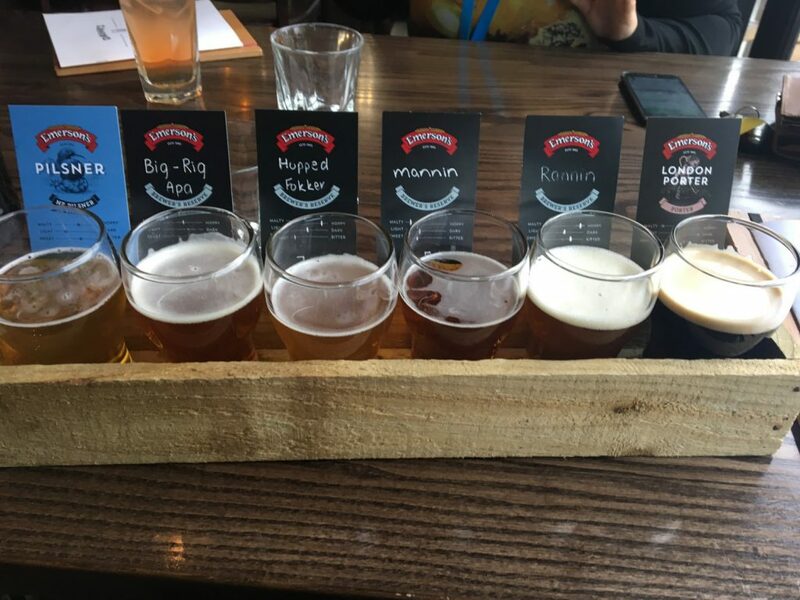 I managed to find my way to the Emerson Brewery to sample their wares (big surprise, I know). This is the southern-most brewery I have visitied! Great single hop IPA and a couple of others that I really liked. 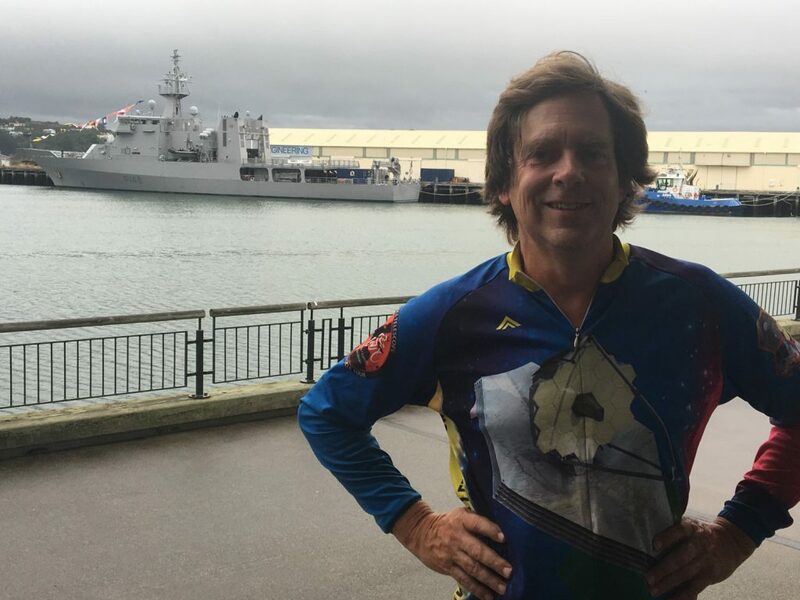 I also had my picture taken next to the New Zealand Navy. Southern-most beer on the Tour. I am told that this ship is the complete New Zealand Navy. I cannot confirm this, however. 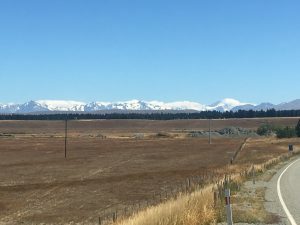 On Thursday, (2/9), I took a bus back to Christchurch to visit my friends John and Adrienne. I am here now. 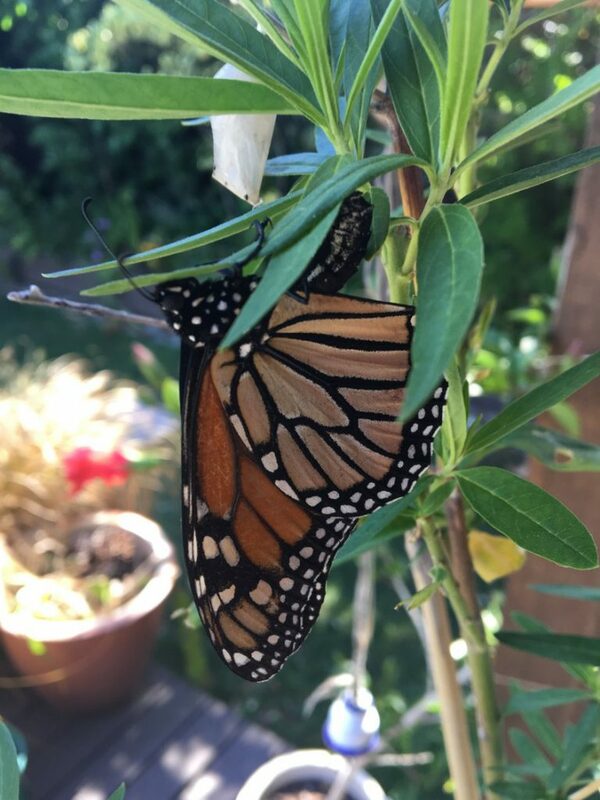 Yesterday, I saw a monarch butterly in their yard and snapped this shot. Yesterday evening, we had a dinner party with some very interesting people. First, there was Gary and Ruth, a couple. Both Gary and Ruth suffer from cerebral palsy to some extent. 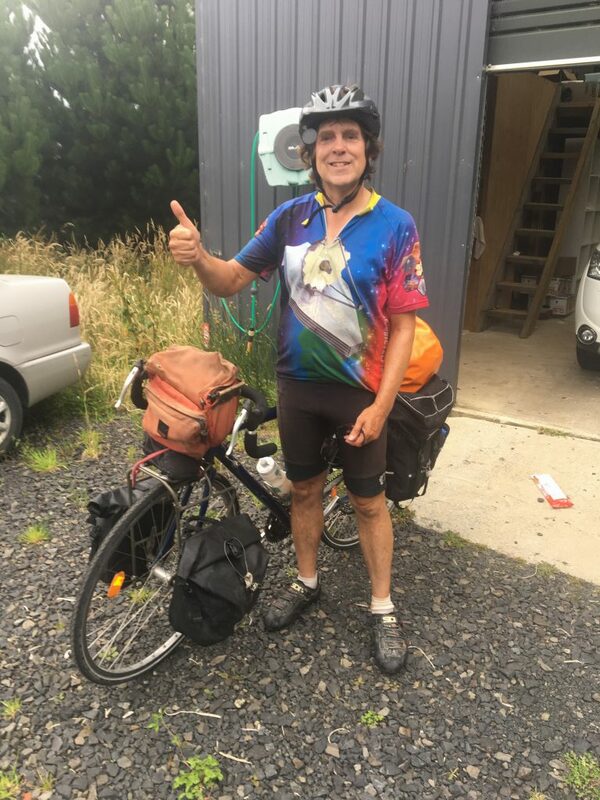 I love meeting people who experience life differently than I do; you might say that this is why I am doing this ride. It was great talking with these neat folks! Then, there was Mark Rocket who was the first New Zelander to book a flight on Virin Galactic’s suborbital space ship. Now is that cool, or what!? Mark is also a founder of Rocket Lab, a New Zealand company that will launch your payload into space. $5M gets a 150 kg payload into LEO. That’s a bargin! 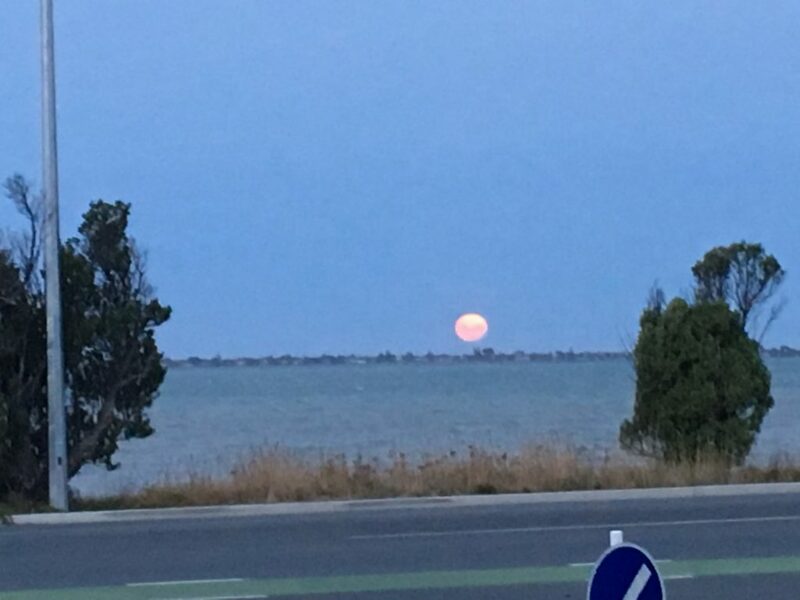 It was a nice dinner, and we watched the ice moon rise on the ocean. I will check back with an update in a few days. See you then!